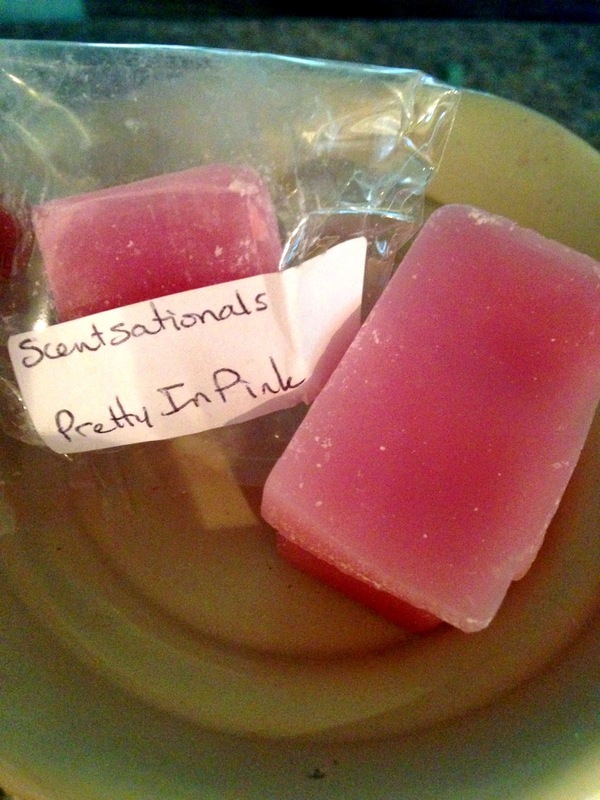 Scentsationals Pretty In Pink- This tart and the one following were gifted to me by Deb (thank you!!). My Wal-Mart(s) sadly lack in the fragrance department and Deb is really sweet about sending me ones she thinks I will enjoy (and I have each time so far!). Pretty In Pink had a medium throw in my large living room/kitchen area and smelled of strawberry cotton candy to my nose. On cold I thought there was some peony lurking but when it melted all the candies poured out. Those hard oval strawberry candies with the liquid centers. Mmmmmm.... I highly enjoyed this scent but I think if peonies were added it would have been more rounded. If I ever catch this in my stores I will repurchase. 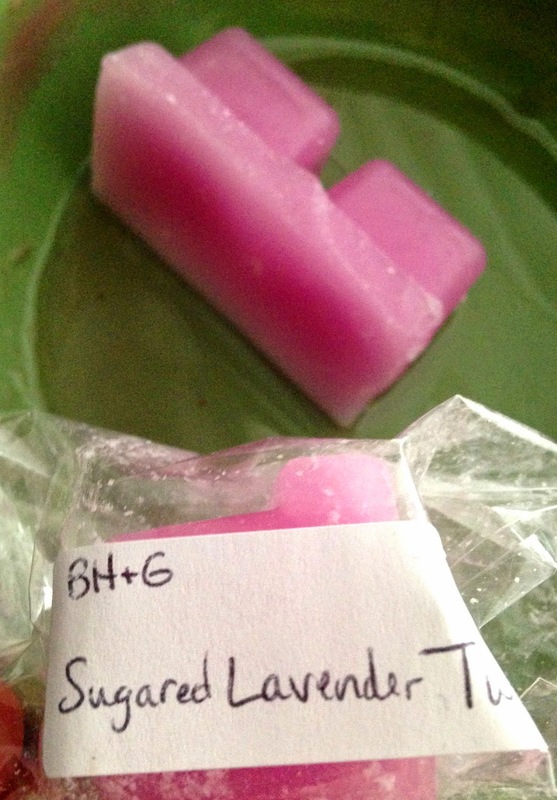 Better Homes & Gardens Sugared Lavender Twist- Sunnee called this the unicorn of the wax world and I agree. Hard to find, magically wonderful. This threw medium-strong in my bedroom and released a Pink Sugar heavy aroma that was laced with sweet mellow lavender. Repurchase if I ever find it. 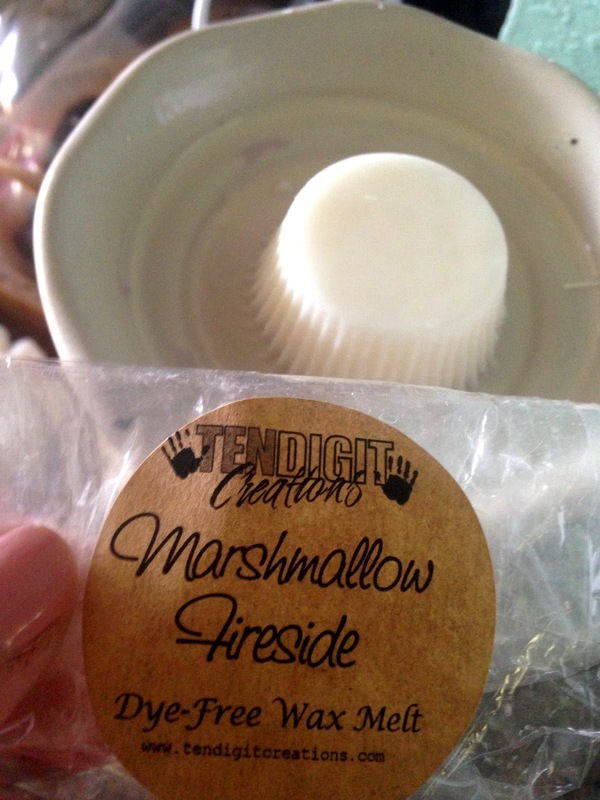 Ten Digit Creations Marshmallow Fireside- A medium (in my bedroom) to medium light (in the kitchen/living room) throwing fragrance that smelled beautifully of lightly toasted creamy vanilla marshmallows with a quiet campfire accompaniment. This is one of the closer Bath & Body Works Marshmallow Fireside dupes I have encountered (along with Lasting Scent Candles). Repurchase for sure. I do wish the throw was a bit more but I still enjoy it at this level, especially in my bedroom. MMMMMMMMMMMMMMMMMM, marshmallow fireside. Yum! Going to add this to my TDC wishlist. Yay for Pretty In Pink! Yezzzzz!!! My TDC wish list gets longer and longer. Thankfully she has that awesome 13 scent individual option! You know... As I was pouring out Pretty in Pink I got a nice musk from it. Interesting. Yeah, but not a realistic berry by any means and not any cream. A very generic artificial sweet berry scent. There is something else going on in it and it had a musk vibe. I want to compare it to CFTKR Strawberry Musk scent now. I have one cube left. I may do that. It is a mystery! I wish they would put notes for this one lol! Thank you again Deb!!! Ah! Their website says "soft and sweet as candy"
Hey! You found the cream colored glade warmer :) Thanks for the review of Marsh Fireside, it sounds like a good one to try and I'm glad it's a very good dupe. So, if you had to choose one, between the Pretty in Pink and Sugared Lavender, which would you choose? I did find it, but now with the new ones coming not sure how I will arrange them. Ooooh you cut to the quick woman. Which one.... Sugared Lavender Twist. But I DO like the other one too. You??? ?